Removal of one-way gyratory traffic system and introduction of two-way operation is a historic change for Archway. Islington Labour councillors have been keeping a close eye on the progress of Transport for London’s (TfL) project to transform Archway, something for which the local party has been campaigning for years. 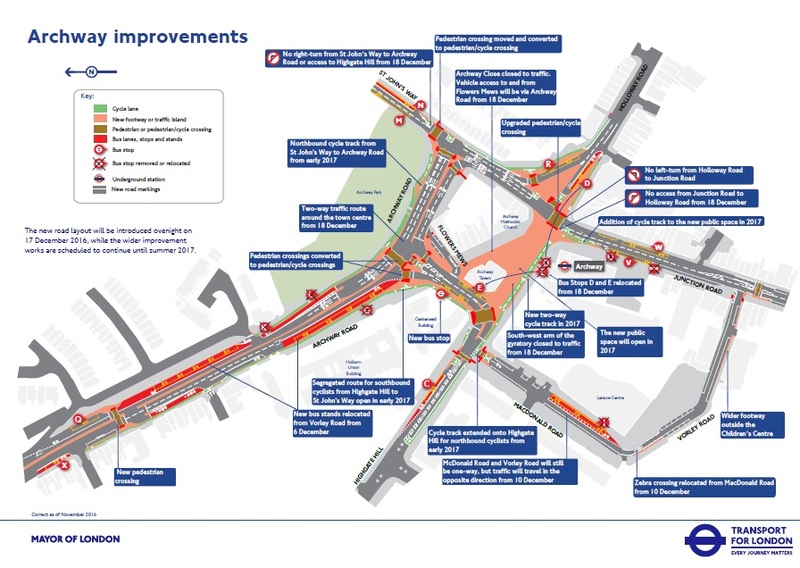 TfL’s improvements will create a new public space, replacing the gyratory, along with cycle lanes and improved pedestrian crossings. The works are expected to be completed by summer 2017. In December 2016, the change from the one-way gyratory traffic system to a two-way operation marked a significant step forward in the project, which will open up new employment opportunities and improve safety in Archway. The traffic switch-over, which is the first of its kind in Archway, has meant that TfL has had to make some changes to bus services passing through the new road layout and bus stop locations. Following pressure from Islington Labour councillors, TfL agreed to install clearer signage in the area to inform passengers of the changes and review the possibility of some bus routes terminating elsewhere. Cllr Claudia Webbe, Executive Member for Environment and Transport, said: “I am pleased that we are edging closer to this major change in Archway. The removal of the gyratory will radically transform the area, benefitting all who use it.